Richard helps students and faculty with research. In addition to spending regular hours on the reference desk, he chooses titles for Celtic Studies, English, and German, teaches students how to find and make sense of print and web resources, manages the library website, and creates and updates research guides and learning objects. Richard is also liaison librarian for the Mediaeval Studies Program, the Celtic Studies Program, and the German Department. As an undergraduate, Richard worked at the Carleton University MacOdrum Library in Ottawa. He liked it so much that after receiving journalism and English degrees at Carleton University, he obtained his library qualification at the University of Toronto (MISt, 2004). 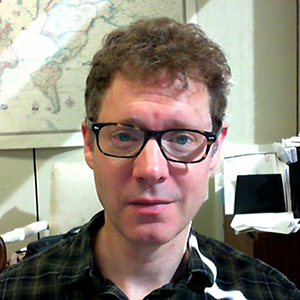 Richard gained more experience at the Data, Map, Government and Information Services Library (UofT), the Thomas Fisher Rare Book Library (UofT), and the City of Toronto Archives. He joined the Kelly Library in 2004.